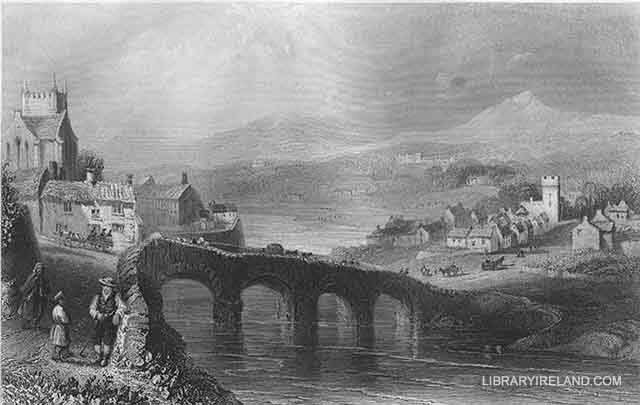 Following the course of the Dargle downwards, we reach, at a distance of four miles, the neat little TOWN OF BRAY, situated on the sea-shore, about a mile behind the promontory of Bray Head. From Bray the tourist generally proceeds to visit the GLEN OF THE DOWNS, a beautiful dell, resembling the Dargle, though on a somewhat smaller scale, which lies a few miles south of Bray. This glen is walled in by mountains (clothed in many parts with oak, ash, and evergreen shrubs), so precipitous as barely to leave room for the narrow road and the small bright stream that glides through the romantic vale with a devious course, producing at every step a constant succession of new charms. 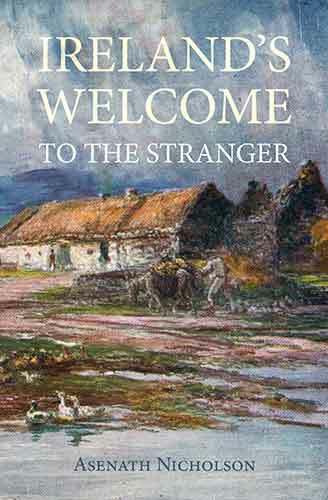 High upon the wooded hill, to the left going from Bray, stands a banquetting-house and a romantic cottage, so delightfully situated as to impart an air of poetry to the whole landscape. These tasteful accessories to the beauty of the scene have been constructed by Mrs. Latouche, through whose extensive and finely-wooded demesne of Belleview this enchanting glen runs. 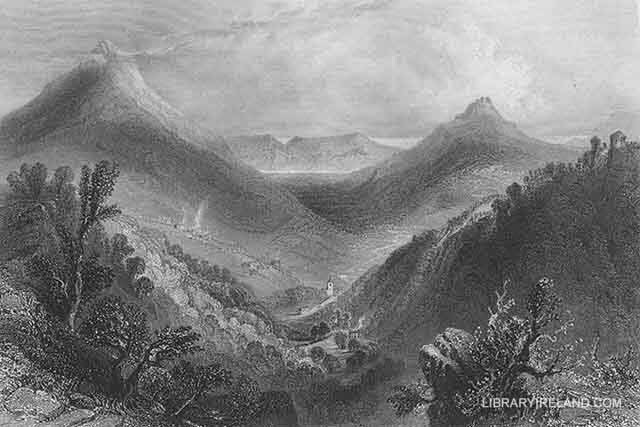 From an octangular room in the banquetting-house, the best view of the surrounding country may be obtained;—the glen far beneath, with the many-tinted sides of the rocky steeps by which it is overhung, rich in native woods and abundant plantations, and the sublime galaxy of neighbouring mountains, amongst which the dazzlingly white peaks of the two Sugar-loaf hills tower conspicuously, present a scene of luxurious softness, combined with grandeur and magnificence.